The story behind this quilt: The other day I found some yellow and red triangles in my stash, which I had trimmed from blocks for a previous project (see it here). They were paired with RST so I just had to stitch them together, press, then assemble them into rows. What next? The resulting rectangle of half square triangles stayed on my design wall for a couple of weeks. The solution to my design problem came from two ladies, Leonie Bateman and Deirdre Bond-Abel, who own Quilted Crow, a store in Tasmania, Australia. 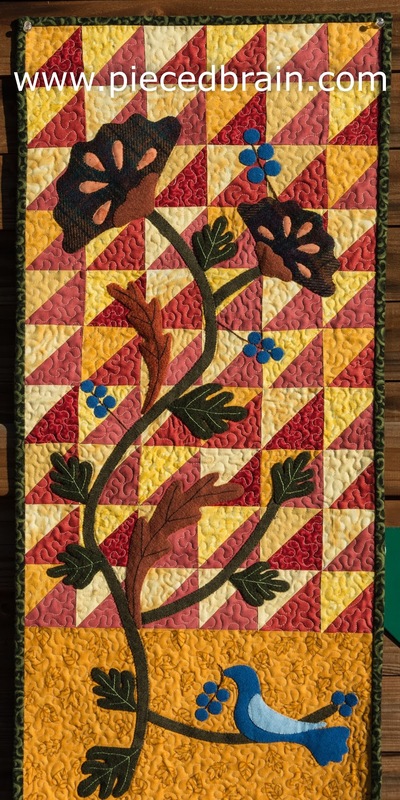 I was browsing through their new book called "Country Elegance" and wouldn't you know - I found a wool applique project (pictured above) with half square triangles on the background. My background was much bigger than the one used for the pillow in the book, so I changed the design to fit it. 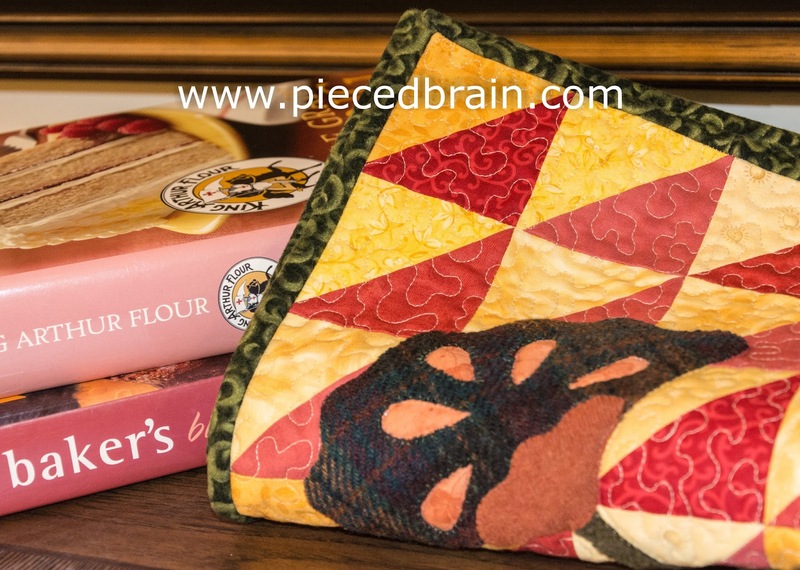 This book has beautiful projects with creative combinations of piecing and applique, two techniques I use a lot on my quilting projects. So, it is a keeper! Notice that the flowers have reverse applique - a new technique for me. It was so easy to follow the the pattern instructions! 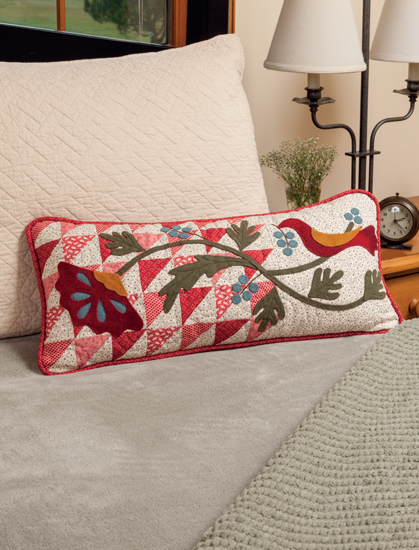 Reverse applique is quicker to do when you use wool and cotton as you don't need to needle turn any part of it. I will use this idea on other projects but, before I do, there is a table runner in the book that I will have to make. In the meantime, I hope you are keeping warm and quilting away! It's just beautiful! I think the red and yellow makes the perfect backdrop. Great job! 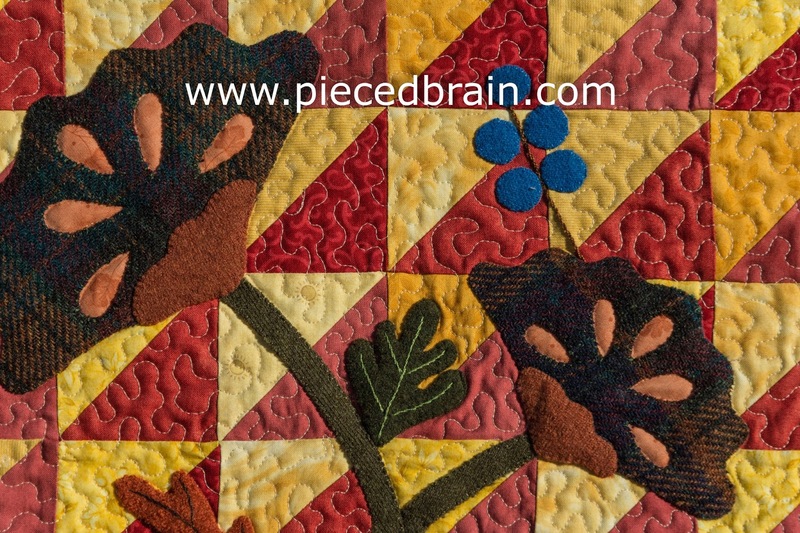 I love applique' placed on a pieced background. Great quilt! Your wall hanging turned out so pretty. I like that you found an idea for the applique in a book and then used that in your own way. Hi Denise, thanks for your visit on my blog, She Quilts Today, what a nice blog you have here, I love your work, this is a beautiful wall hanging, you did a great job on reversed applique! Absolutely beautiful. The red and yellow remind me of all the fall leaves I see. They look great. You did an amazing job!! It really speaks to me.